Engraving on laid paper, 16 ½"h x 21 5/8"w plus margins, uncolored. Beautifully framed with archival materials. 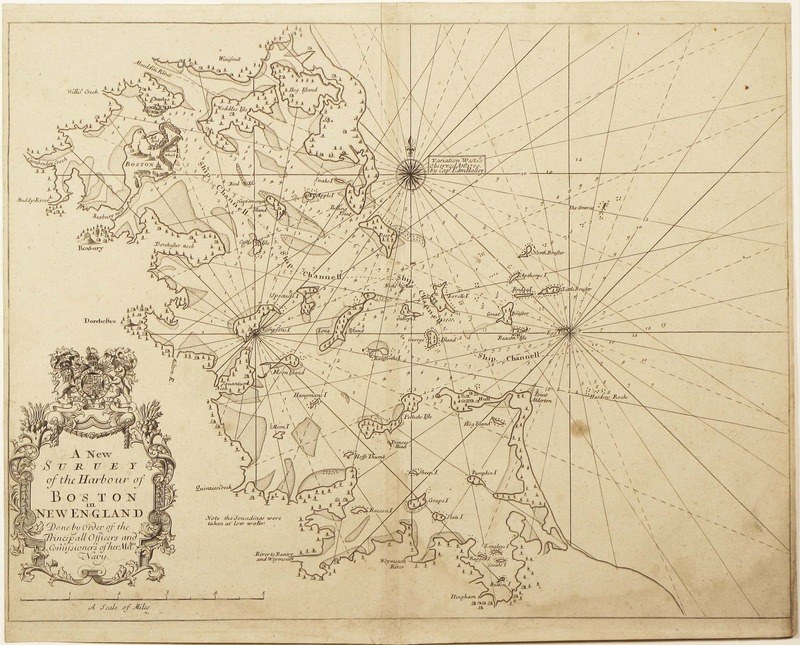 A considerable rarity, and the most detailed chart of Boston Harbor for its time. The chart depicts Boston Harbor from modern-day Winthrop in the north to Hull and Hingham in the south. It provides an immense amount of information for these complicated waters, including the many harbor islands, hundreds of soundings, and a multitude of rocks and shoals. Of particular interest is the ship channel that threads its way between Bruster, George, Lovells, Long and Spectacle Islands. 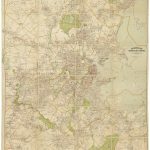 There is also a surprising amount of terrestrial data, particularly in the depiction of Boston, where Beacon Hill, the Mill Pond, and the concentration of housing in the North End are all clearly visible. 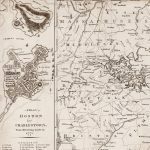 Though not the first navigable chart of Boston Harbor-that honor goes to Thomas Pound’s New Map of New England, known from a lone example held at the Library of Congress-this is one of the earliest a collector can hope to obtain. A smaller chart of the area did appear in the 1689 first edition of the English Pilot. Fourth Book, but it was so schematic as to be more hindrance than help to pilots. The chart is unsigned, and it does not resemble any earlier manuscript or printed charts with which this writer is familiar. A note next to the compass rose reads “Variation West 10° Observed Ano. 1700 by Capt. Edm. Halley,” however this data which was readily available from Halley’s 1702 chart showing worldwide magnetic variations, and I know of no evidence that Halley himself conducted detailed surveys of Boston Harbor. The chart’s sources must for now remain unknown. This chart first appeared in the 1706 edition of The English Pilot. Fourth Book and according to Verner was issued as late as 1732. The Pilot was originally developed by the London publisher John Seller, who conceived it as an effort to break the Dutch monopoly on chart publication. While the two-volume first edition focused on European waters, later editions achieved worldwide coverage, with the Fourth Book focusing on the Americas first appearing in 1689. During its publication history of over a century, the Fourth Book went through 37 editions. The chart is also found in some examples of the Atlas Maritimus, a composite atlas published to order throughout this period. In 1767 one Boulter Grierson engraved and published a new edition of the chart in a pirated edition of the English Pilot. Early editions of The English Pilot. The Fourth Book are very rare, as is the chart. 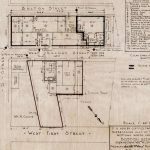 This writer knows of only two examples having appeared on the market since 1983, including the sale of this impression by the firm of Martayan Lan in or around 1995. Boston Engineering Department, List of Maps of Boston, p. 29 (with a 1707 date). Phillips, List of Maps of America, p. 165 (Grierson edition only). Mercator Society, English Mapping of America 1675-1715, #19. Verner, Facsimile Edition of The English Coast Pilot The Fourth Book, chart #30. Winsor, Memorial History of Boston, vol. II p. lii (illustrating the Grierson edition). Oddly, the chart is neither mentioned nor illustrated in Krieger & Cobb, Mapping Boston. Gently toned, a couple of unobtrusive spots, and a faint tide mark at lower right. Upper and lower margins trimmed close with 2" of lower-right margin reinstated. Withal, quite good for a chart of its type.